It is possible for cats to get Lyme disease, though it is very rarely seen in cats. Cats do not always develop symptoms like dogs and humans, so diagnosis can be trickier. Lyme disease is a tick-borne illness that affects a variety of species, and is commonly seen in humans and dogs. It has been reported in cats after experimental infection with B. burgdorferi, though experts are still studying whether it occurs naturally in cats exposed to infected ticks. Nevertheless, it is a diagnosis to consider when cats have symptoms compatible with Lyme disease, especially in areas where Lyme disease is common, as 95 percent of confirmed Lyme disease cases have been reported in 14 states in the United States: Connecticut, Delaware, Maine, Maryland, Massachusetts, Minnesota, New Hampshire, New Jersey, New York, Pennslyvania, Rhode Island, Vermont, Virginia, and Wisconsin. Cats and dogs can become infected with Borrelia burgdorferi without ever developing symptoms of Lyme disease. Where Lyme disease is common, cats may test positive for exposure to the bacteria despite not showing any signs of disease. When any symptoms of Lyme disease are present in cats, they can include some of the common Lyme disease symptoms. Lyme disease is caused by Borrelia burgdorferi, a type of bacteria that is transmitted by ticks. These ticks become infected with the bacteria by feeding on infected mice and other small animals. When an infected tick bites other animals, it can transmit the bacteria to these animals. Lyme disease is transmitted by the deer tick (also called the black-legged tick) and a group of other closely related ticks. The exact tick species varies by location, but the deer tick is small enough to bite animals and people without being easily detected. Cats that spend a lot of time outdoors, especially in areas with bush or tall grass, are most at risk of being infected with Lyme disease. It is important to remember that ticks can be carried into yards on other animals, so even cats that don't roam far could potentially be bitten by a tick. Ticks are frequently found on dogs, so if you have a dog, the tick can hitch a ride into the home on the dogs and then bite the pet cat. There is currently no evidence that Lyme disease is spread by direct contact between animals, including between infected pets and their owners. Because so many cats do not develop symptoms after infection with B. burgdorferi, the diagnosis of Lyme disease must be made on a combination of factors, including history (especially exposure to ticks), clinical signs, finding antibodies to B. burgdorferi bacteria, and a quick response to treatment with antibiotics. An antibody test is not enough to make a diagnosis on its own because not all cats that are exposed to B. burgdorferi get sick, and the antibodies can persist in the blood for a long time after exposure. Other diagnostic tests such as blood tests, urine tests, X-rays, and sampling of joint fluid may be done as well to check for more serious effects of Lyme disease such as kidney disease and to rule out other conditions that can cause similar signs and symptoms. Treatment with antibiotics usually produces a rapid improvement in symptoms. If there are more serious issues that might be secondary to Lyme disease, such as kidney disease, a longer course of antibiotics along with additional medications is usually necessary. Your vet will come up with a treatment plan that is aligned with your cat's needs and medical situation. Tick control is extremely important for the prevention of Lyme disease (and other diseases that can be transmitted by ticks). This is true for both pets and humans. 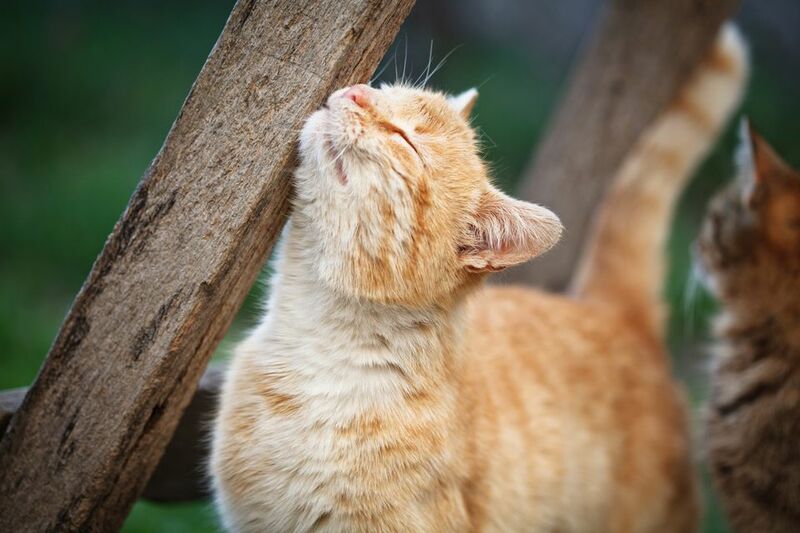 Check outdoor cats daily for ticks and safely remove them as soon as possible. In long-haired cats, be sure to pull back the fur and examine the cat at the skin level. A tick will attach itself to the animals' skin, not fur, if it is feeding. Since ticks must feed for at least 12 hours (possibly 24 to 48 hours) before transmitting the bacteria that causes Lyme disease, removing the tick as soon as possible can help prevent transmission. Be careful handling ticks as they are potentially infective to people too. If possible, try to save the tick in a sealed plastic bag or container. Some vets will want to examine or test the tick, but that will vary on a case by case basis.